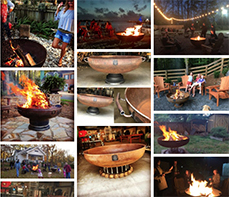 This 30″ hemisphere fire pit is smooth and clean. With its hidden handles this pit truly is a sculpture. Perfect for 2-10 people. It has a 1/2″ drain hole to keep the elements out and comes with a 46″ standard handcrafted poker. If clean design is your thing this is your pit.